Putting together a graduation party is no less stressful than planning a reunion. Once you've finally put the party menu for graduation together the next thing on the list is the party favors and by now, you're exhausted. Finding party favors for high school and college grads is always a challenge. Will it be cool enough? Will it get thrown out? Or worse yet, will everyone conveniently forget to grab one before they go. One rule we like to follow is, ask yourself, "Is this useful?" If your answer is yes, then you've got a winner. Also, keep in mind you can never go wrong with sweet pastries like cake pops and cupcakes. 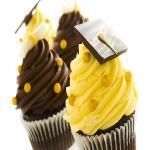 We've put together 10 DIY graduation party favors that are either useful, delicious or creative. Add cake to a large bowl. Crumble until it resembles fine crumbs. Add in frosting a little bit at a time until cake is moist and can hold a ball shape, yet still slightly crumbly. Use your hands to incorporate the frosting into the cake crumbs. Use a mini ice cream scoop and scoop out two balls of cake mixture. Roll the mixture into a tight ball and place on a plate. Repeat until all the cake mixture has been rolled into balls. Melt 2-4 ounces of white chocolate in the microwave. Dip the tip of the cake pop sticks into the white chocolate and insert into the cake balls about half-way. Freeze for about 20 minutes. Remove cake balls from freezer. Dip cake balls carefully into the chocolate until covered. Let the excess chocolate drip off. Swirl and tap gently if needed. Stick the decorated cake pop into a styrofoam block to finish setting. Place into the freezer to speed up setting time. Cover with a clear treat bag & ribbon for gift giving, if desired. Store in a single layer, in an airtight container. Buy these chocolate covered pretzels on Etsy or make your own. Use these cute stickers to top soda bottles like IZZE or old fashioned soda pop bottles or use them to put on the bottom of Hershey's kisses. Take the first three items above plus a few extras and make a Candy Bar. Have grads fill up their own bags for a quick and delicious party favor as well as doubling as a decorative display at your graduation party. Get all the responsible parents to contribute $10 in $1 bills, roll them up and tie them with string to make little diplomas, then divide among the number of grads at your party. Pick up some cute containers and make some custom stickers that say “Your Hard Work Has Paid Off.” As an added bonus, stick a larger bill in one of them for an added surprise. Put together survival kits for those students graduating high school or college. Fill them with essentials for heading off to college or starting a new job, living on their own, etc. In this instance, these photo vases are used for centerpieces. 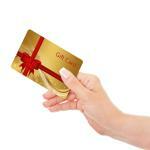 But we also think these would be great gifts for recent high school graduates. Make your vases then fill them with pencils, pens, highlighters as a useful gift for heading off to college. They make an excellent keepsake and your grad will enjoy keeping this on her desk (make sure you include a picture of you too). Make cupcakes and find cute boxes at your local store, tie a ribbon and send those grads home with a sweet treat. Stack of books? Boring. Well, not really. Do it creatively and fun. You can get great book deals on Amazon - select one funny one, one that is simple advice and a dictionary. Throw in a custom bookmark to your survival kit or your stack of books. For Chic Sake put together some beautiful monogram bookmarks that you can customize. What will you do for your graduation party favors? Share with us in the comments below or on Twitter or Facebook. Get more graduation party ideas or graduation party food recipes here.